Just a quick note about playing back current encoding types under Linux. 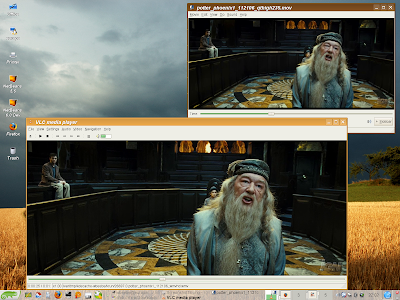 The following screenshot shows Gnome's Totem (2.17.3) and VideoLAN's VLC (0.8.6) playing back the latest Harry Potter clip ("Harry Potter and the Order of the Phoenix"). Not the exact same clip. Totem is playing back a QuickTime high resolution clip in the upper right corner, while VLC is playing back a Microsoft HD WMV clip below Totem. I haven't resized either application. The desktop is 1600 by 1200 resolution. I will note that Totem can play both clips, but it does not play back the HD WMV clip very well, dropping frames and loosing sync with the audio. VLC plays it back flawlessly. I've tried this same experiment with Ubuntu 7.04, with the same two applications and the same two clips, and found that both Totem and VLC play the HD WMV clip without dropping frames. I can't speak to any audio issues, as the audio is broken again on the machine that is hosting Ubuntu. 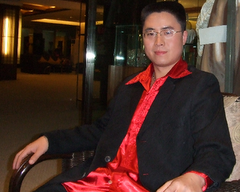 The clips came from RottenTomatoes. Keep in mind that this is all happening on a modest (!) Athlon XP 32-bit processor running at a paltry (!) 2GHz. The video card is an ancient (!) ATI 9700 Pro. And I've got a lot of other tasks running on the machine in the background. A person could do a lot worse than run Suse 10.2 or Ubuntu 7.04. They are two equally superb distributions capable of supporting the same top-notch applications and can provide equal quality experience to the end user.